This Post has already been read 478 times. Leading the developments in digital ecosystem in the country, Telenor Pakistan has introduced Self-Service Booths across the nation to provide easier, securer, and round-the-clock access to its products and services. These booths give customers the option of availing multiple Telenor and Easypaisa services at their convenience such as buying and replacing Telenor SIMs, buying Easyload top-ups & Easycards, and open new Easypaisa accounts at any time of the day without having to visit the Telenor franchise or retailer. These booths will also enable customers to pay their utility bills as well as send and receive money. Featuring biometric verification, these state-of-the-art machines warrant safety and security against unregistered individuals and unauthorized transactions. Telenor Pakistan plans to place these self-service booths across Pakistan to extend greater enablement to its customers in consistence with its vision of fostering customer-centricity across its business operations. 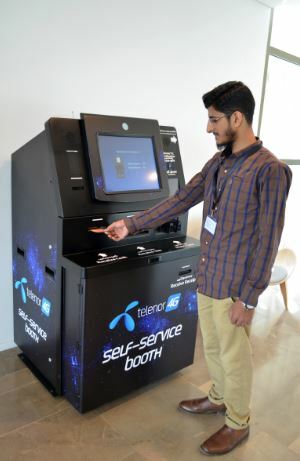 “Self-service booths are going to redefine customer facilitation in today’s digital age,” said Bilal Kazmi, Chief Marketing Officer at Telenor Pakistan. “Through this initiative, we aim to empower the customers by transferring accessibility of Telenor & Easypaisa services into customers’ own hands while reducing dependency on physical outlets characterized with long queues and waiting time. Being a customer centric organization, we are evolving the processes and channels to serve our customer better and we shall continue to introduce innovative ways to bring the best to our customers. The introduction of this round the clock Self Service Booth, bringing access, ease and convenience,is set to redefine the concept of customer services. As part of its #TelenorHearsYou outreach campaign, Telenor Pakistanis actively listening to its customer feedback and concerns, and is taking a proactive approach to ensure delightful experiences for them.